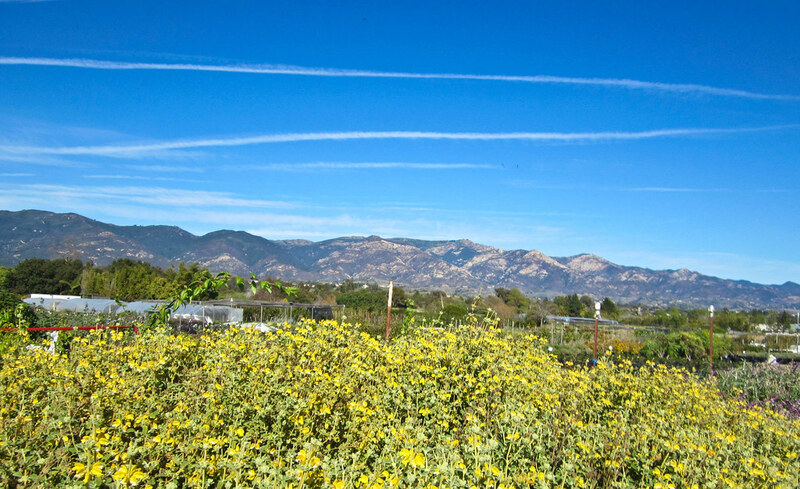 This morning I took a road trip to Santa Barbara to shop at the wholesale nursery San Marcos Growers. But first a few weird and wonderful plants! I’ve set aside a few of the oddities I bought at Annie’s last week. They were sort of impulse purchases because they are so neat. I don’t have anywhere to put them at the moment. On the left is Deppea splendens a rare plant from the cloud forests of southern Mexico that is extinct in the wild and isn’t terribly common in cultivation. I’ve seen online auctions for it go for several hundred dollars but luckily mine wasn’t quite that expensive. 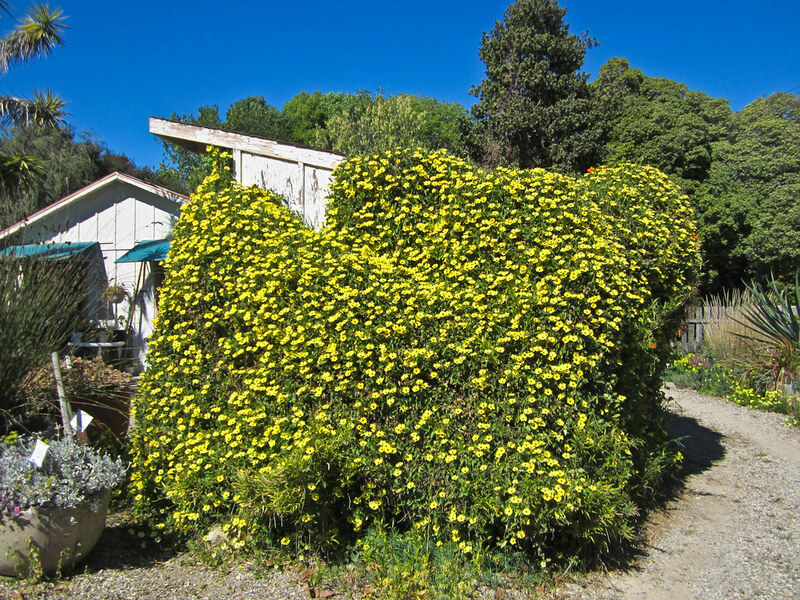 Annie has a cool blog post about it here: Return of the Golden Fuchsia. Frost might kill it and it has been going into the 30’s here at night this week so I bring it in every night. I may pot it up and baby it a while before I plant it out in the garden. To the right of that is Agapetes serpens an epiphyte from Nepal. A few things about this plant I like. One I just like saying Agapetes. Uh-GA-pet-eeze or Ag-uh-PET-eez however you want to say it it’s fun! 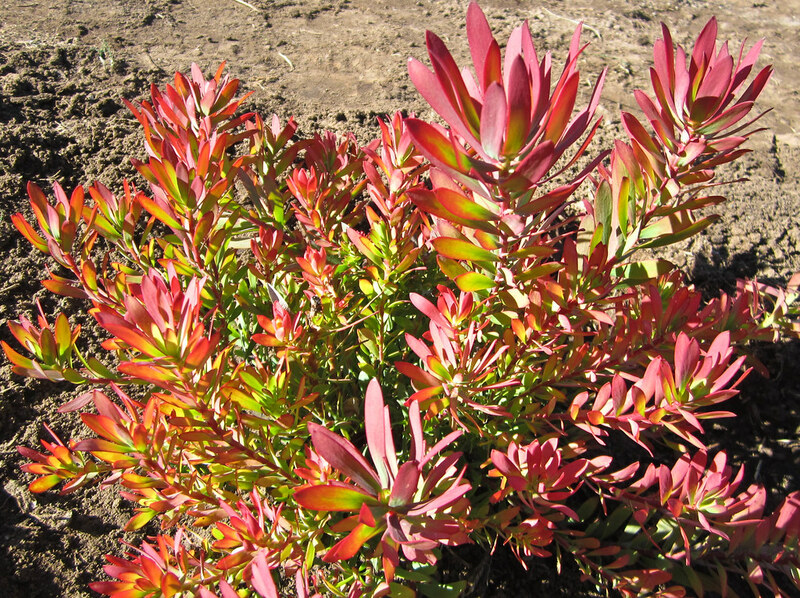 Second it is from the family Ericacea which includes Ericas, blueberries, and Rhododendrons among other cool plants. And third it reminds me of the Upland Tropical Rainforest house in the Enid A. Haupt Conservatory at the New York Botanical Garden. There are all sorts of lovely and weird Ericaceous plants there. 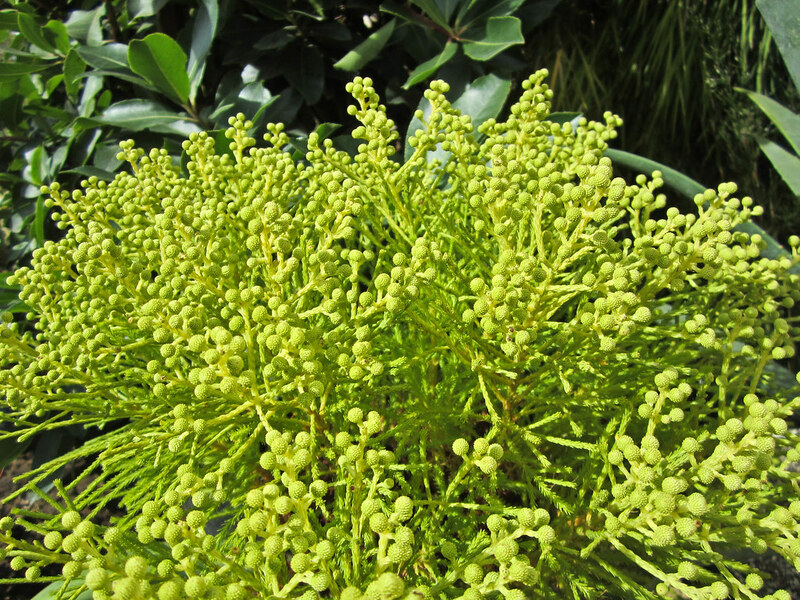 Many of them have flowers and fruit that look like colorful pieces of plastic or candy. I may put this plant in some sort of hanging basket and hang it near my front door. I think it should be fairly happy in foggy Los Osos. At least I hope so. Please feel free to give me any tips if you have grown it. 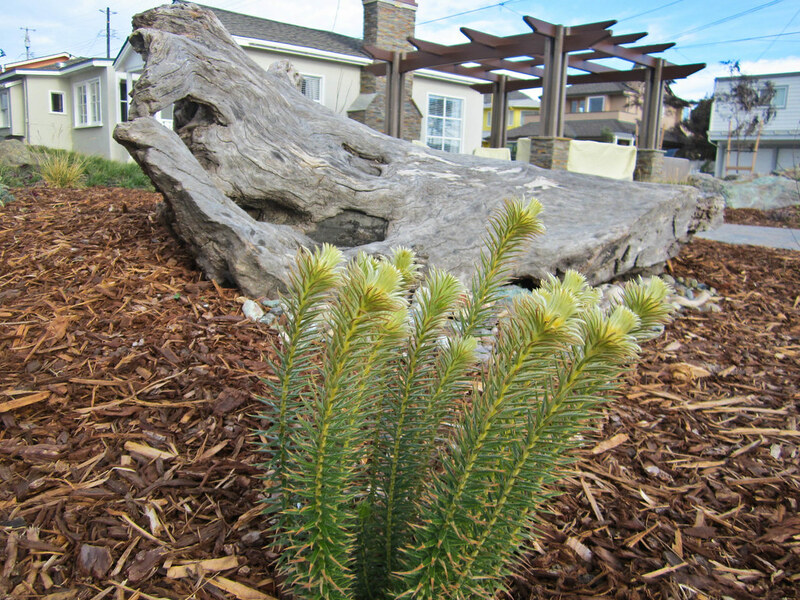 The spiky little plant in front is Maihuenia poeppigii, a cactus from southern Chile. 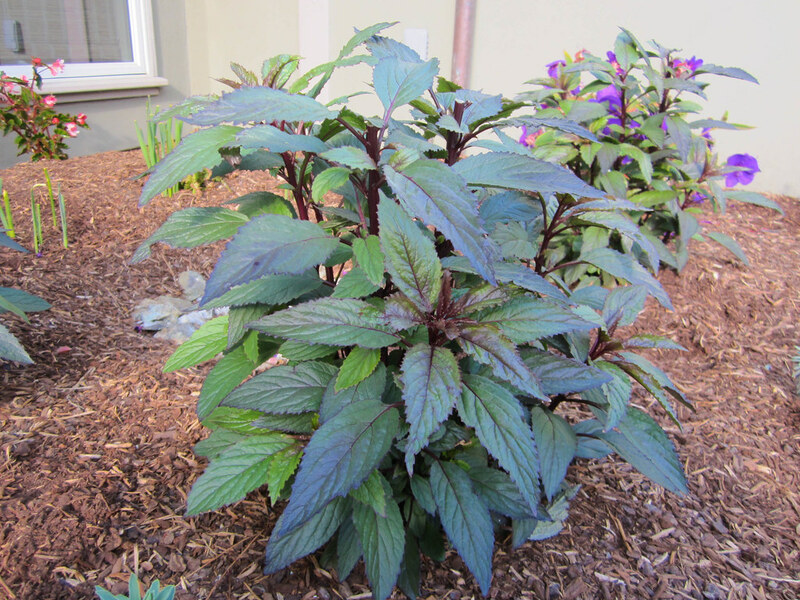 All you have to do is look the plant up on Annie’s website and you will see why I needed it. Cool stuff. 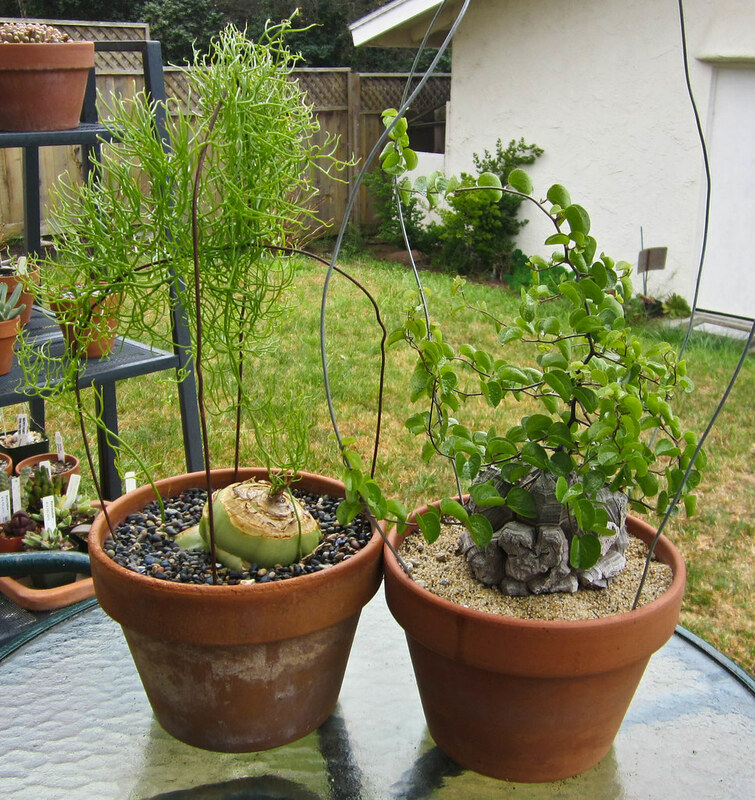 The weird plants in the background are Boweia volubilis on the left and Dioscorea elephantipes on the right. The Boweia I bought at Logee’s in Connecticut on a road trip with my sister back on July 24, 2000. My sister bought one too and much to my shame even though I am the plant person and she is the animals person (she’ll graduate from the School of Veterinary Medicine at the University of Pennsylvania next year – so proud) hers had always done better. But after nearly killing mine about three years ago it is finally bouncing back and looking really good. The Dioscorea I have had for around three years. I’m surprised at how quickly it grows and I am always surprised that it is still alive when it comes out of its summer dormancy. Before I left on my road trip this morning my order from Annie’s Arrived! I know! I know! I was just there last week. Well of course right when I got back I got that evil and enticing spring slide show e-mail and saw a few things I NEEDED. Particularly Lupinus regalis ‘Thomas Church’ which is mail order only. So dreamy. I couldn’t stop myself. Ordered it and then added a few other plants to fill the box. Look at what a great job they do packing the plants. No chance of anything being smushed, huh? This Lupin and another one I bought from Annie’s already has a bud. What do you think should I pinch it out so the plant puts more energy into growing or should I just let it flower. I am so bad at that. I don’t want to wait! 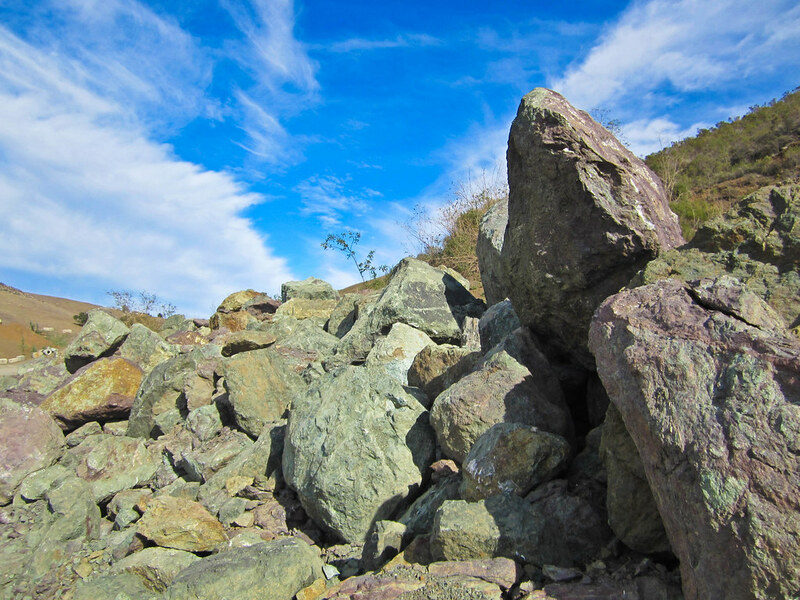 I wish I had some photos of the journey to Santa Barbara. It was such a beautiful day and the hills were covered in bright yellow wild mustard and tiny blue and white lupins were blooming along the highway. But I got a bit of a late start and didn’t have time to stop. San Marcos Growers is a big place and I just had a few hours to fill my car! I fell in love with Thamnochortus insignis the first time I saw this beautiful container specimen last fall. Restios are not the easiest plants to photograph. 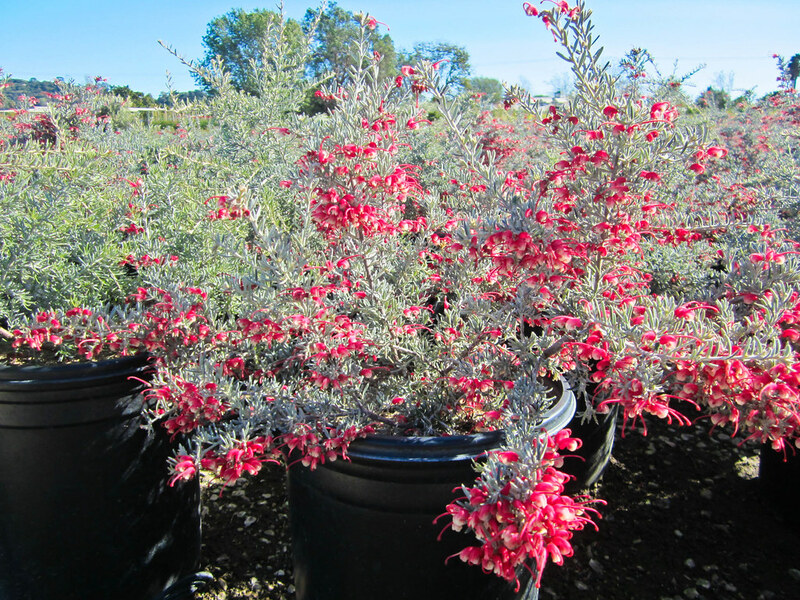 I believe this is a 15 gallon container of Grevillea ‘Long John’. I bought a 5 gallon plant. Such a wonderful plant. 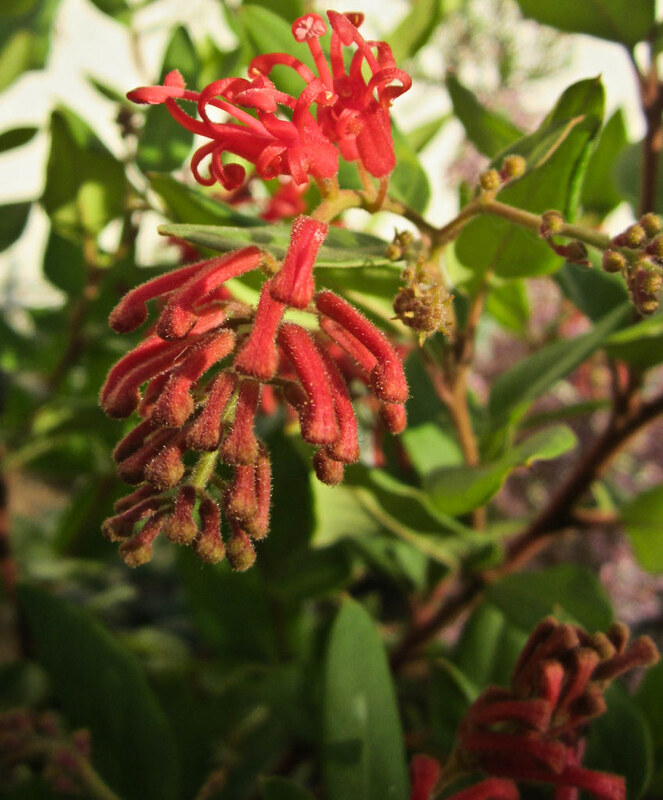 As I’ve mentioned before I am currently having a bit of a love affair with Grevilleas. 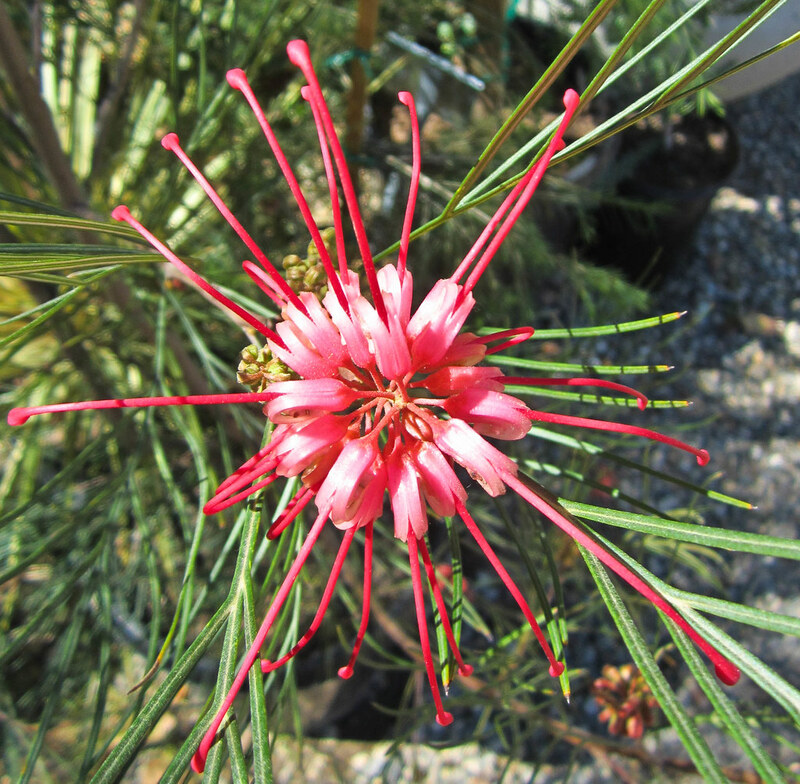 Grevillea ‘Long John’ has large flowers by Grevillea standards. You can’t really tell from the angle I took this photo but they are sort of two tone. Sort of pink and golden orange. This Thunbergia alata is eating a small building. Don’t stand still next to it for too long or you may be next. 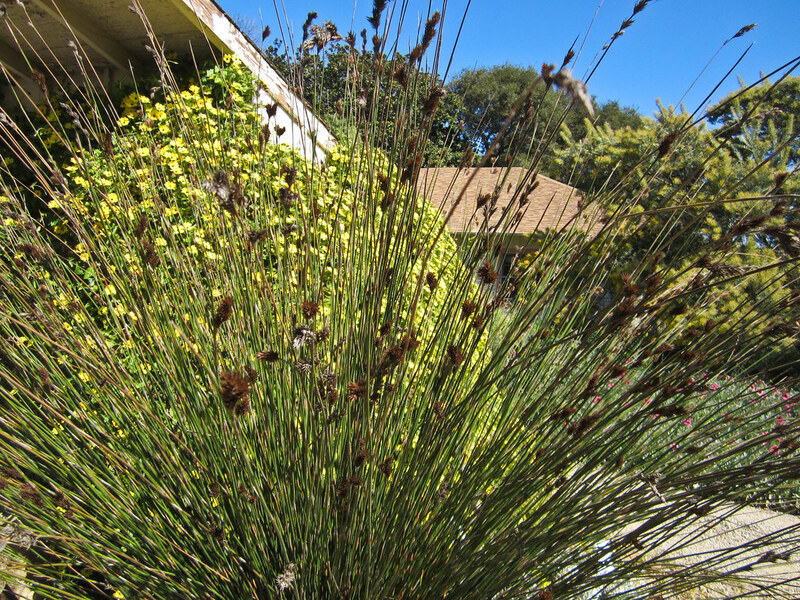 They have this huge display border along a stream or drainage ditch that divides the nursery in half. I loved this little grouping. 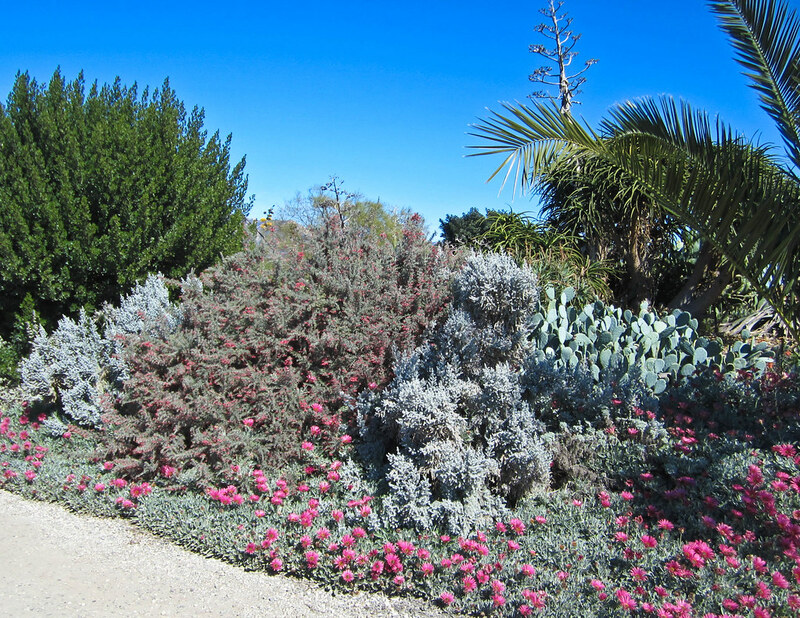 That is Arctotis acaulis ‘Big Magenta’ in the front, I believe the center plant is Grevillea lavandulacea ‘Penola’, which is surrounded by silvery Maireana sedifolia. 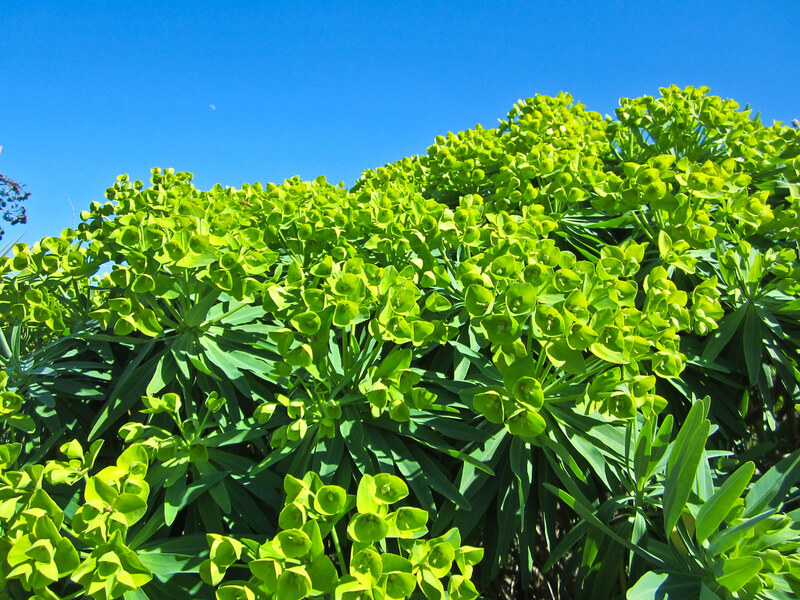 The other day I mentioned how impressed I was with the specimens of Euphorbia lambii at Vince and Janet’s house but boy this one really takes the cake! At least ten feet tall and wide. I must admit I left the nursery with a five gallon pot of it. You can just make out the little white sliver of the moon in the sky. 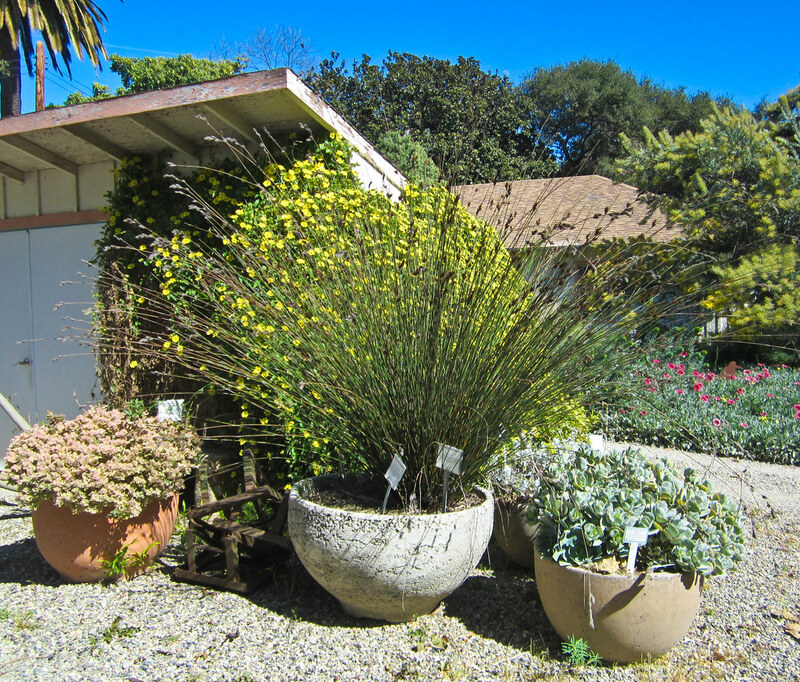 The beautiful Santa Ynez (and maybe San Rafael I’m not sure) Mountains are the backdrop for the nursery and this big grouping of Phlomis lanata. As soon as I took the picture this plant lept into my cart. Sneaky plants. You can’t turn your back on them. 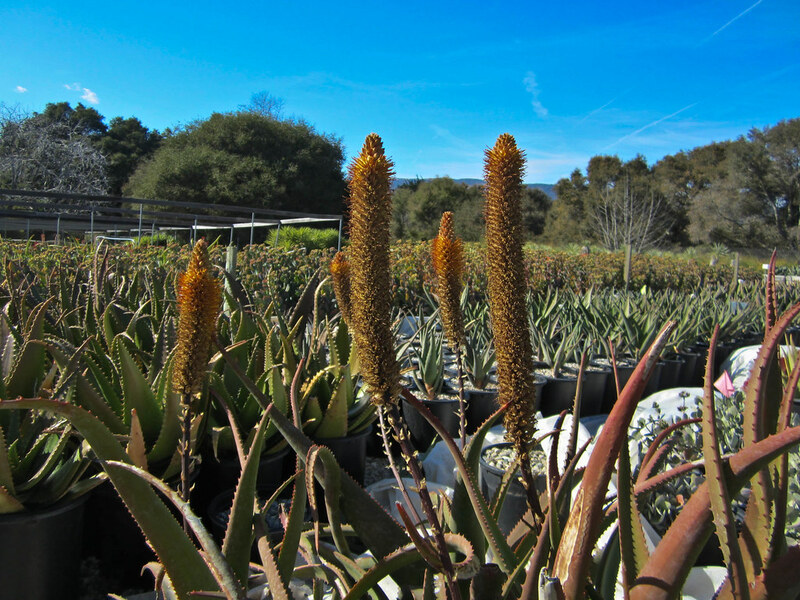 The unusual rust colored blooms of Aloe castanea. This I didn’t buy. But only because I already have some seeds at home. I feel like growing Aloes from seed might be fun because I’m guessing the seedlings will be adorable. I really need to sow them this weekend. And to end our tour I give you this insanely impressive specimen of variegated Echium candicans (possibly the cultivar ‘Star of Madeira’). Apparently no one told it that it is only supposed to be three to six feet tall because this beast screening a work area is easily twelve feet. I’ve seen very big stands of Echiums before but I don’t think I have ever seen one quite this big before and certainly not a variegated one! 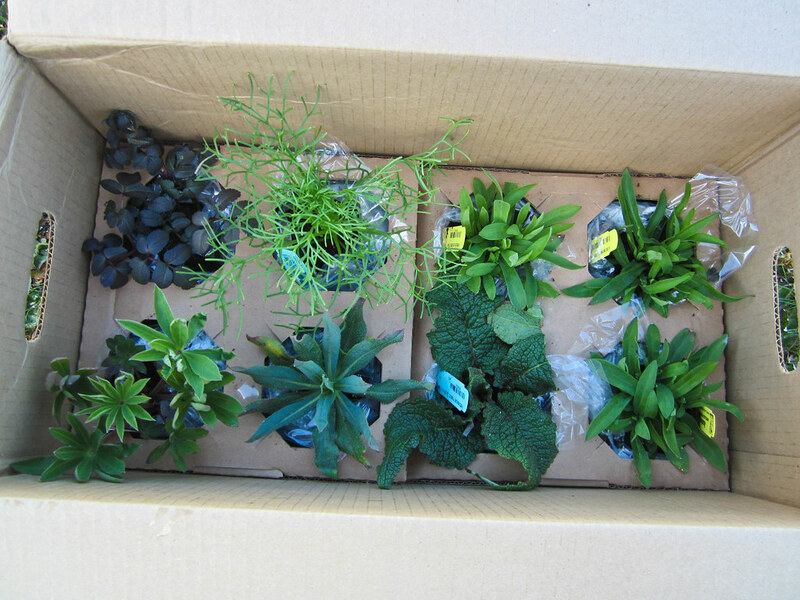 At the end of the day I bought forty six more plants. Not as many as the two hundred that followed me home from Annie’s but these are all in one, two, three and five gallon pots so I have my work cut out for me. 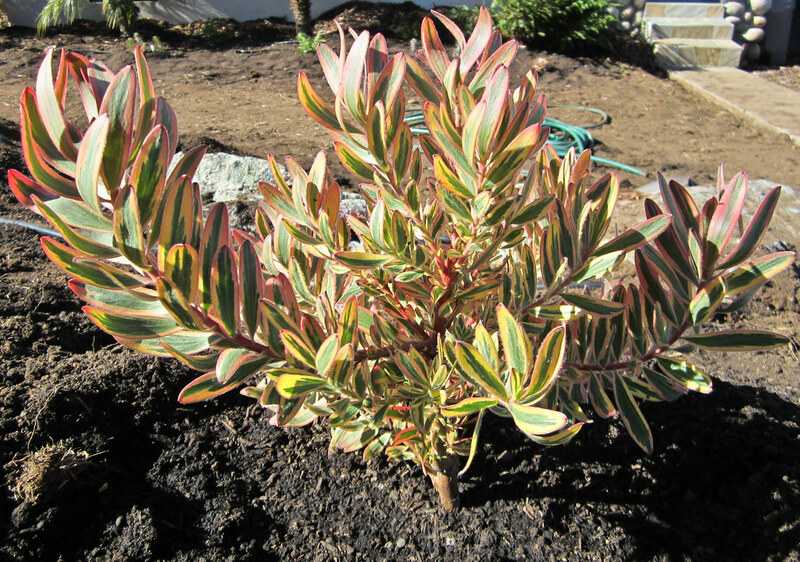 I ended up falling in love with so many shrubs and large plants that I decided on the spot to create a shrub border in the six foot by twenty three foot bed that I wasn’t sure what to do with. It should cover up an ugly chain link fence and also give me a bit of privacy in my side yard once they fill in. So now my garden will be full of plants from Native Sons, Annie’s Annuals, and San Marcos Growers plus a few mail order sources that should be arriving soon and of course some seed grown plants. I just wish someone else was going to plant them all for me! You may remember my post back in November titled Inspiration. Well I am excited to say that the construction for that design began this week. 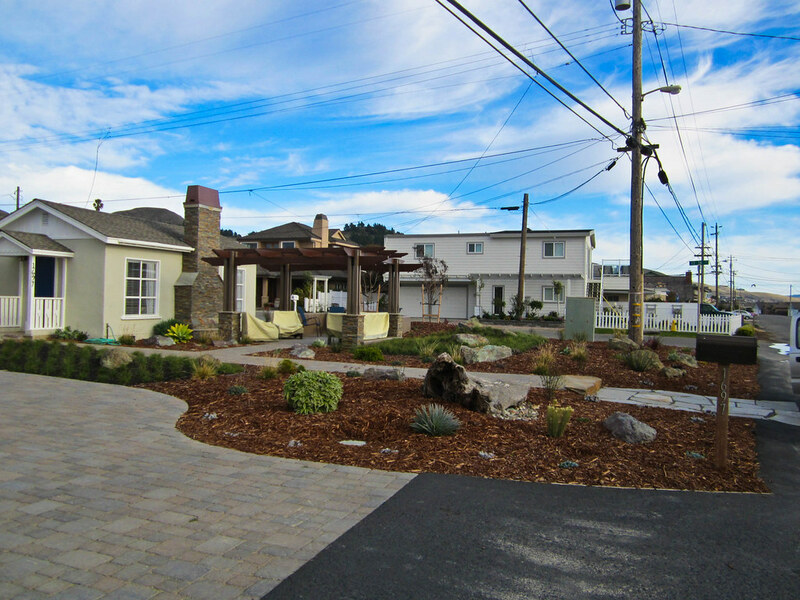 The crew over at Gardens by Gabriel are hard at work preparing the landscape for the planting that is to come in this Morro Bay garden. Normally “before and after” pictures would be in order but I am too excited to wait for the after so you will get the “before and during” pictures today and the after pictures will have to come when we are finished. The “during” being the hard work behind the scenes that make the garden possible. 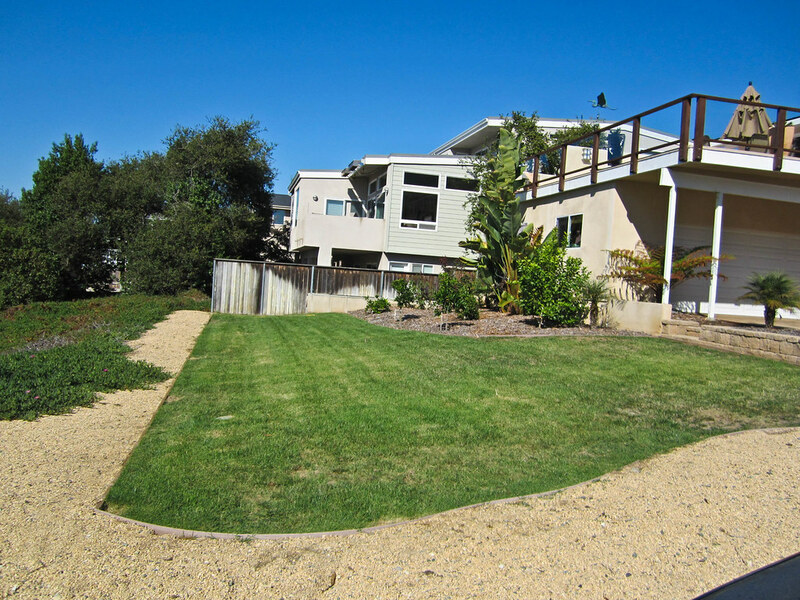 This is the lower lawn of the property. 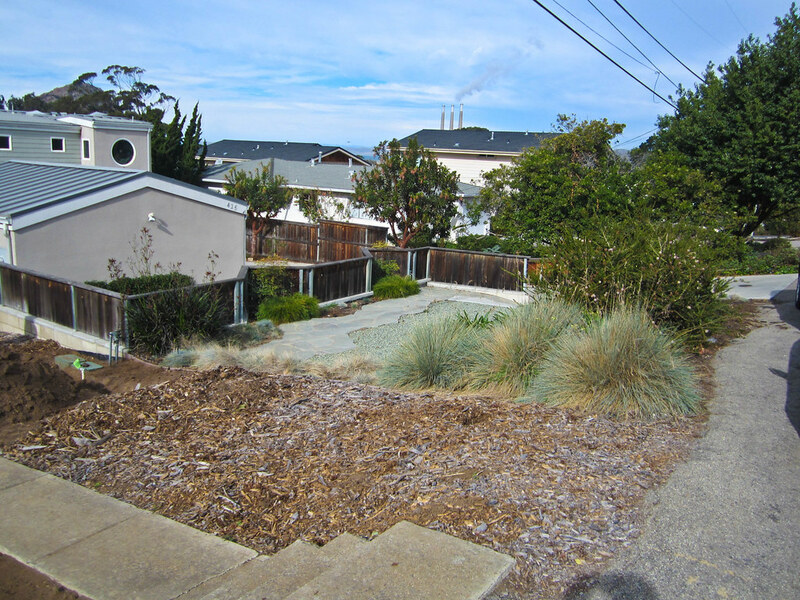 The entire home is on a pretty steep hill. 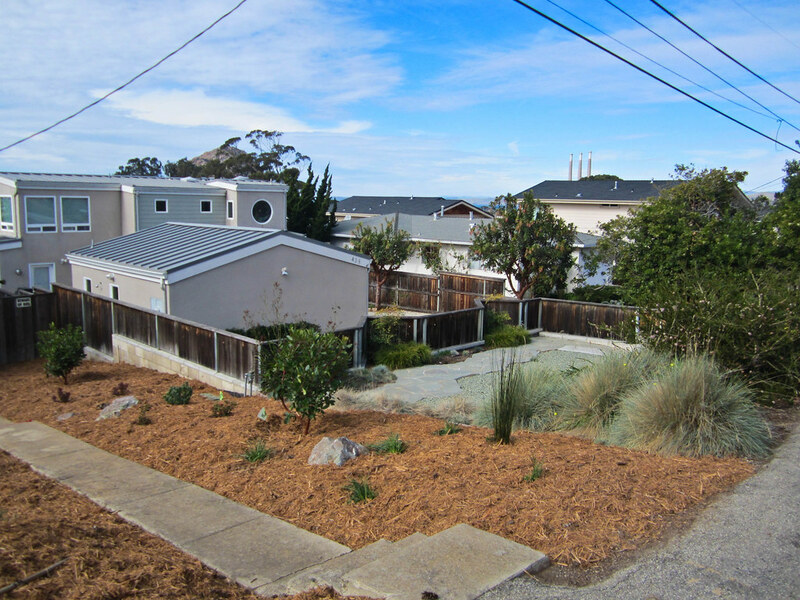 The balcony in the upper right corner of the photo has a beautiful view of the bay which is just a block away. Dan drives the Bobcat while Victor checks the level. This area is being prepared for a Bocce Court! 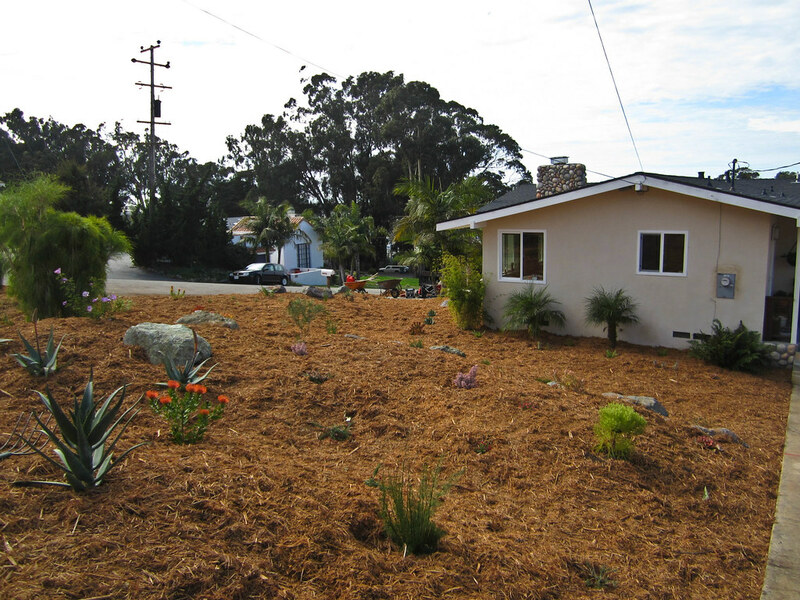 It will be surrounded by the homeowners existing fruit orchard and new, mostly succulent, plantings. 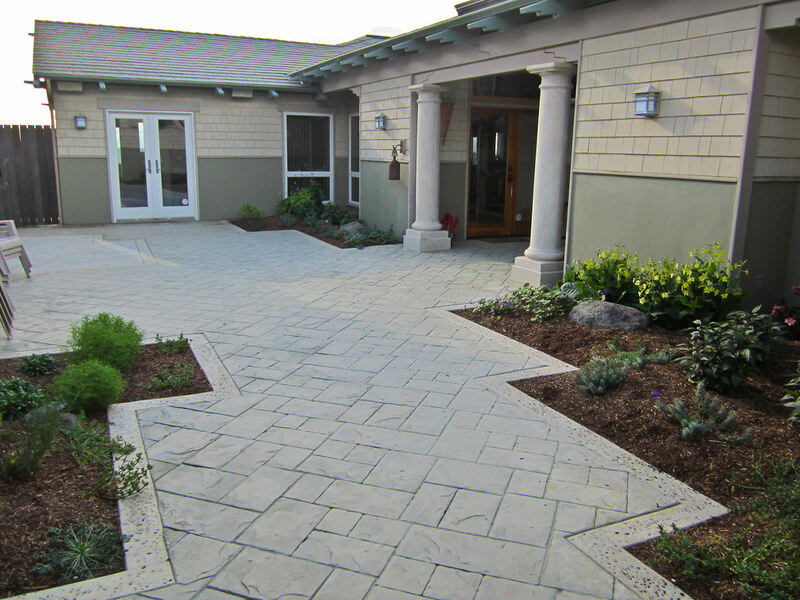 This is the before shot of the front entrance and the upper lawn. All of the palms on the upper lawn were removed to make way for the new design. One way for homeowners to save money on the construction is to do some of the preparation work themselves. 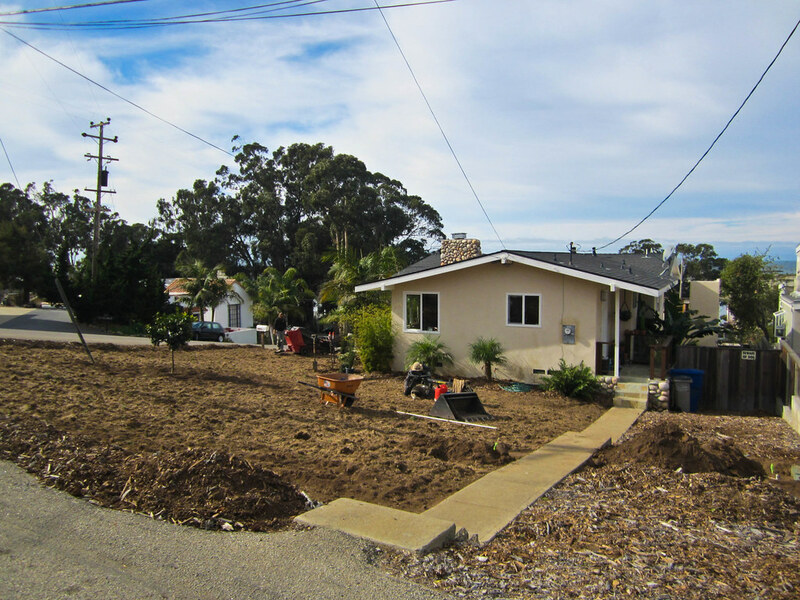 He killed and tilled the lawn and removed the palms before we began our work. He will also build the bocce court himself. 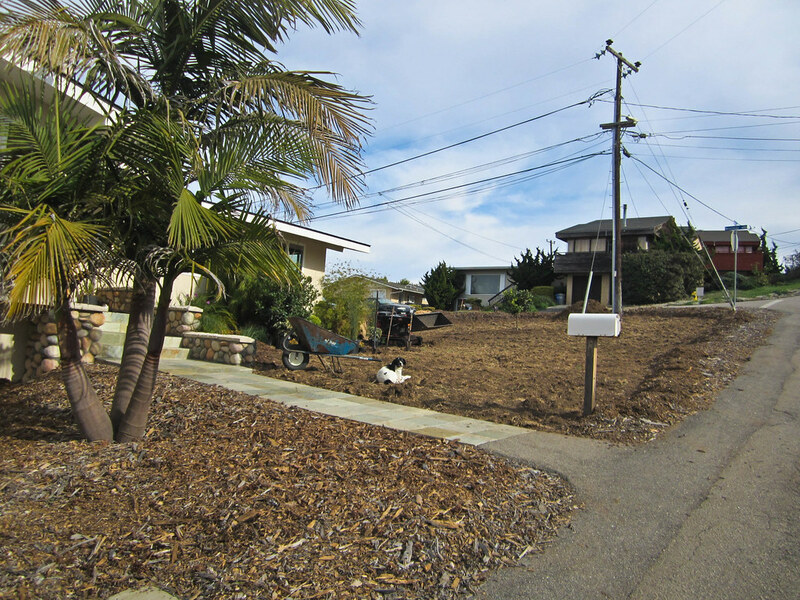 The palms are all gone and some of the foundation plantings were moved to other areas. Garden mascot Cody watches over some of the plants that have been delivered. The upper lawn. I believe there were six palms that were removed. As you can see the property has a pretty severe slope. We will remedy this by creating berms. Unfortunately there is also an unsightly telephone pole in a pretty prominent spot on the property. There isn’t a lot you can do with utility poles or lines. In this case we are going to do our best to disguise its view from the house with large plants. 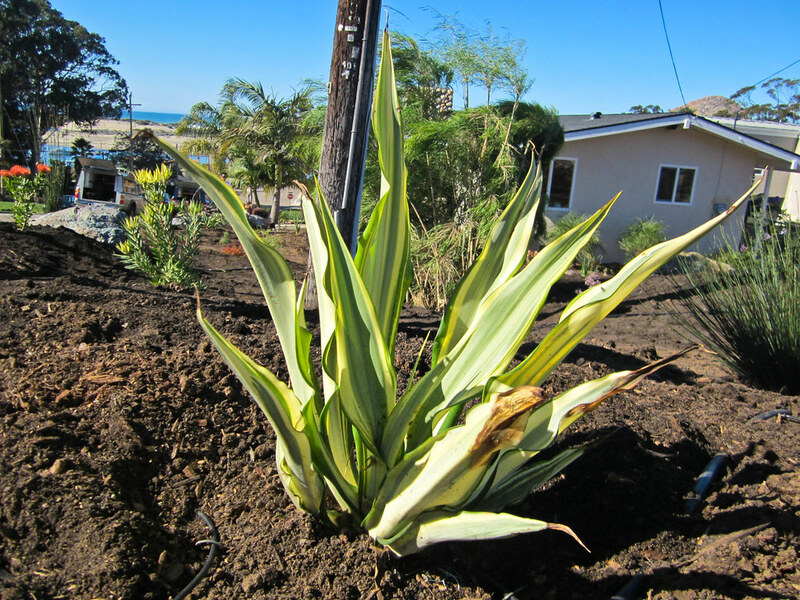 There is an existing Otatea acuminata aztecorum right up against the foundation of the house. Since it was poorly placed to begin with we will move it to a better spot and use it to try to soften the utility pole a bit. As you can see some of the foundation plantings are gone. 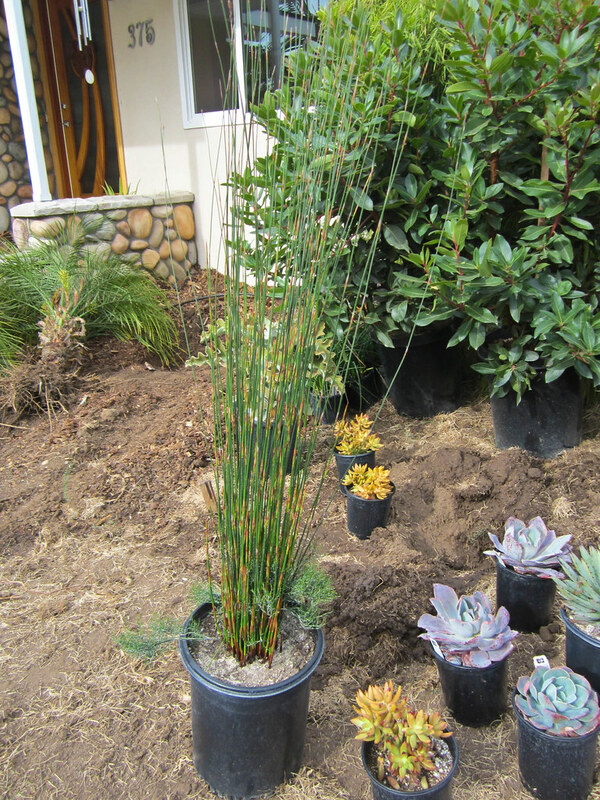 Some Cyperus have been moved near the driveway and some small palms removed. 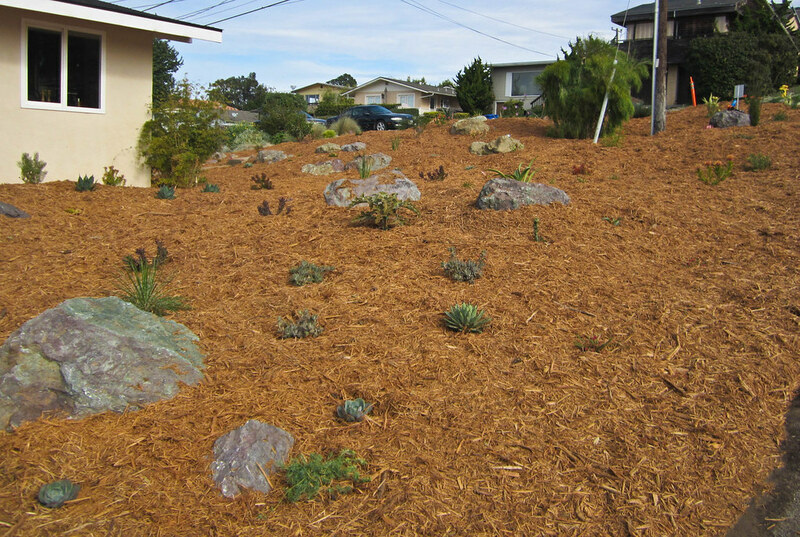 More Woodardia ferns will be added to the remaining foundation plants. 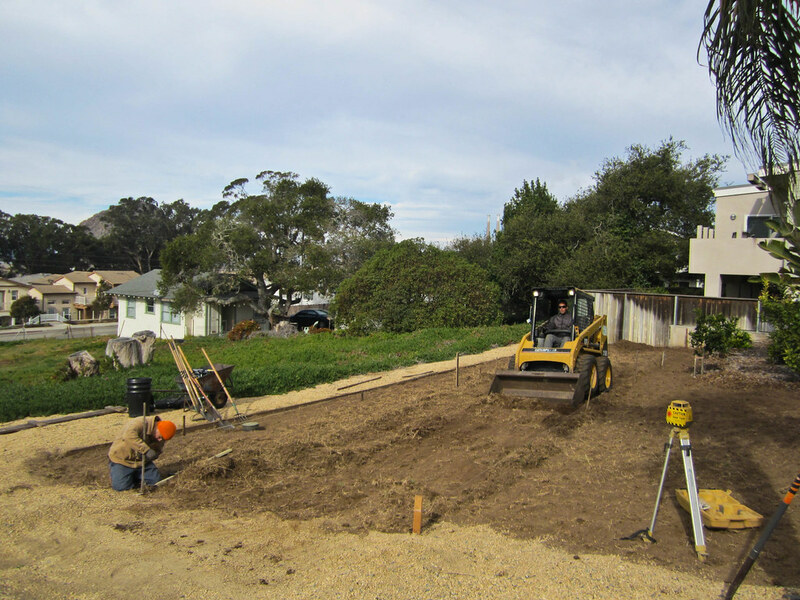 Irrigation is being prepared and soil that is coming out of the lower lawn to level the bocce court area will be brought up to create the berms. Another ten yards of soil will be purchased and delivered tomorrow. The lime tree on the left hand side of the lawn will be moved down to the lower lawn. Garden design books always talk about using “borrowed views” to enhance your garden. I’m pretty sure all of those books were written about huge English estates with vast lawns and beautiful vistas to frame. It is a bit frustrating when your own view consists of a large telephone pole. The view to the north isn’t so bad though. Sadly Morro Rock is hidden behind some trees (you can just make it out peeking out behind the trees in the upper left) and we have a pretty solid view of the infamous Morro Bay smoke stacks. 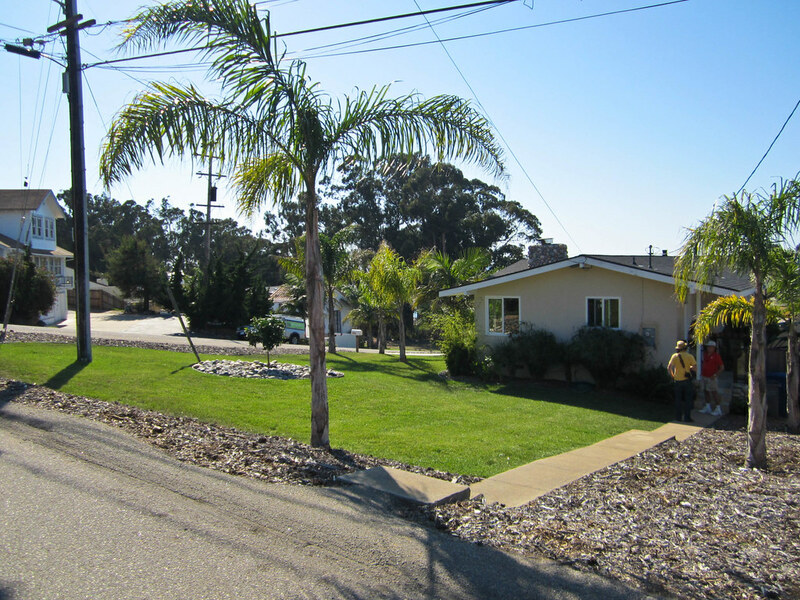 But we also have a nicely landscaped neighbors yard. One thing that caught my eye right away was the two beautiful Arbutus ‘Marina’. So I capitalized on this and included two of our own to mirror the neighbors along the fence. 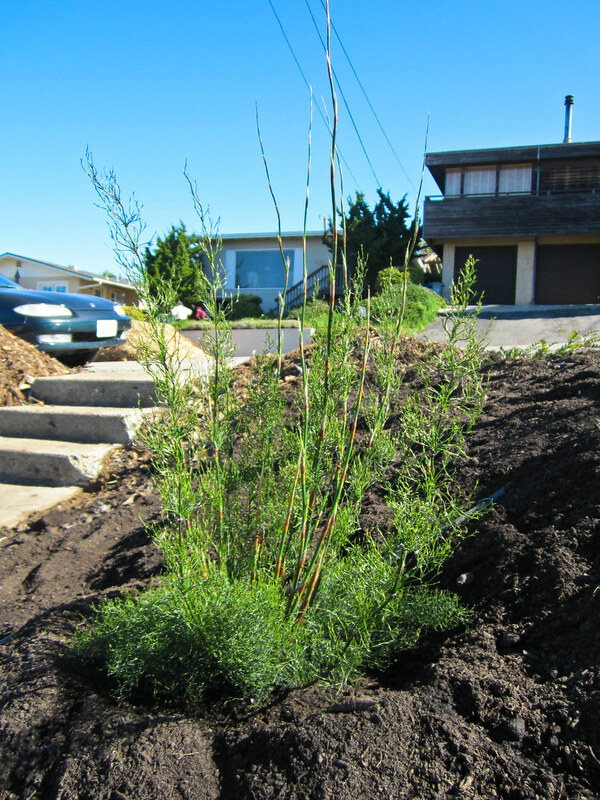 The street planting consists of a Melaleuca and some Helichtotrichon. 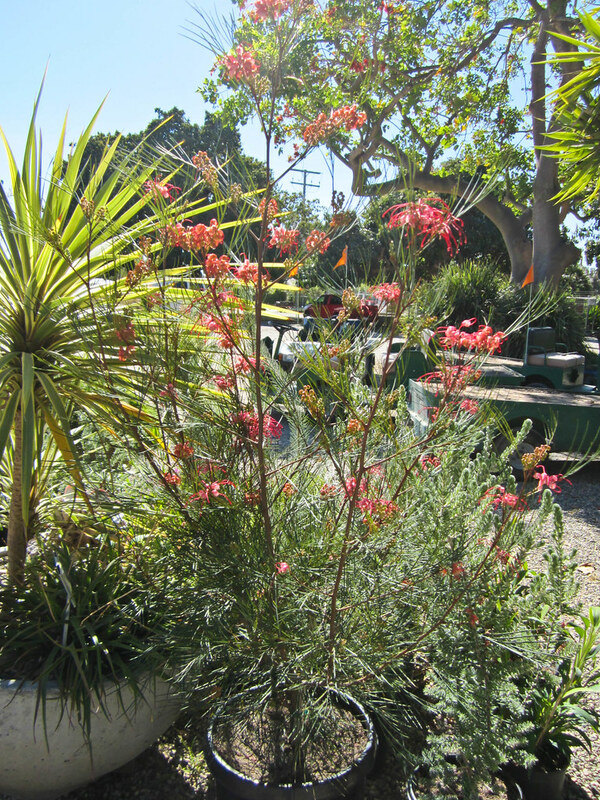 I feel that our planting of Knifofias, Thamnochortus, and Grevillea will compliment the neighbors bed perfectly. Our order from San Marcos Growers down in Santa Barbara arrived already and I am pretty excited about the quality of the plants. 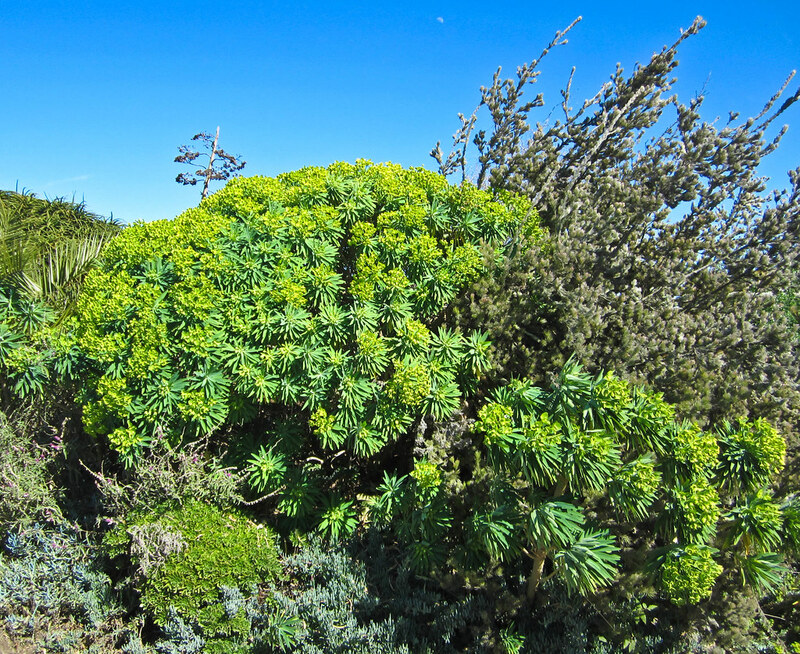 The weird plant above is Berzelia lanuginosa a South African plant that I think will look great with the Protea themed garden. 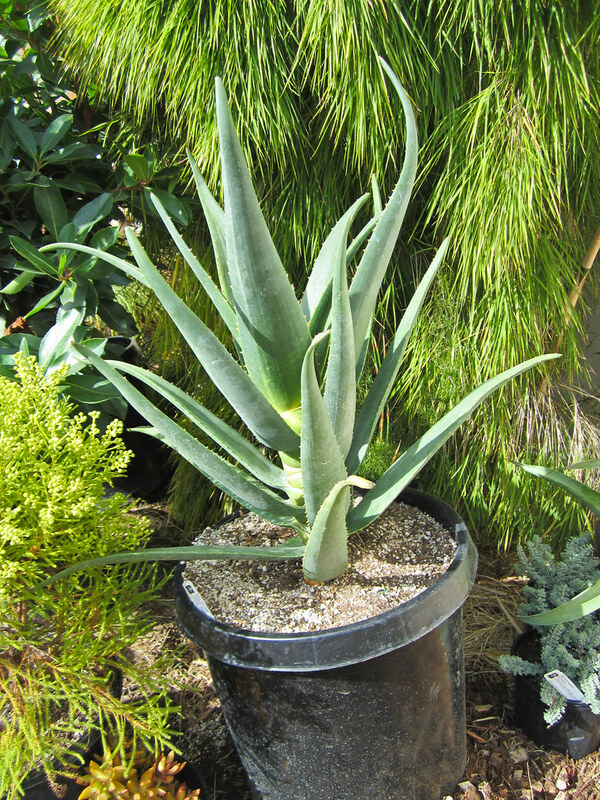 Aloe ‘Hercules’ is a tree Aloe that can grow thirty feet or more. I originally wanted to use Chondropetalum elephantinum but when I saw Thamnochortus insignis I liked it better so we made a last minute switch. 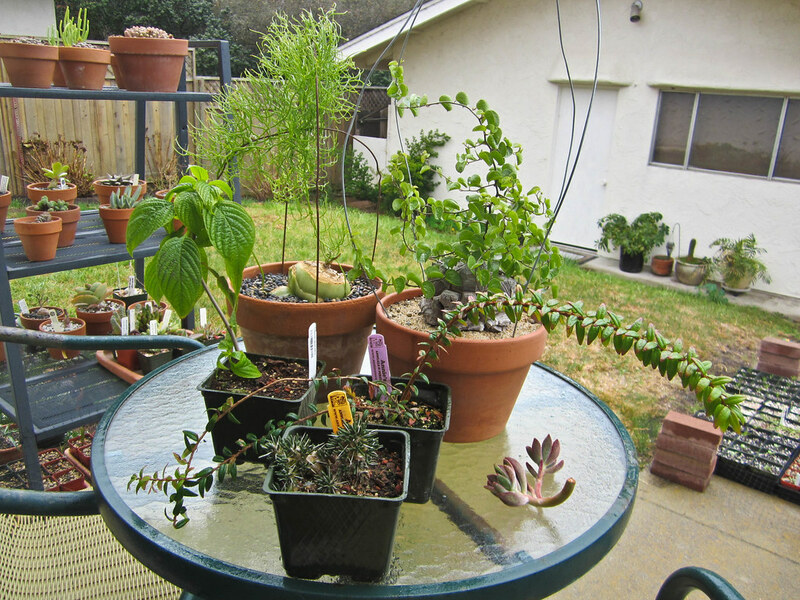 Here it is along with some of our succulents and our two Arbutus. 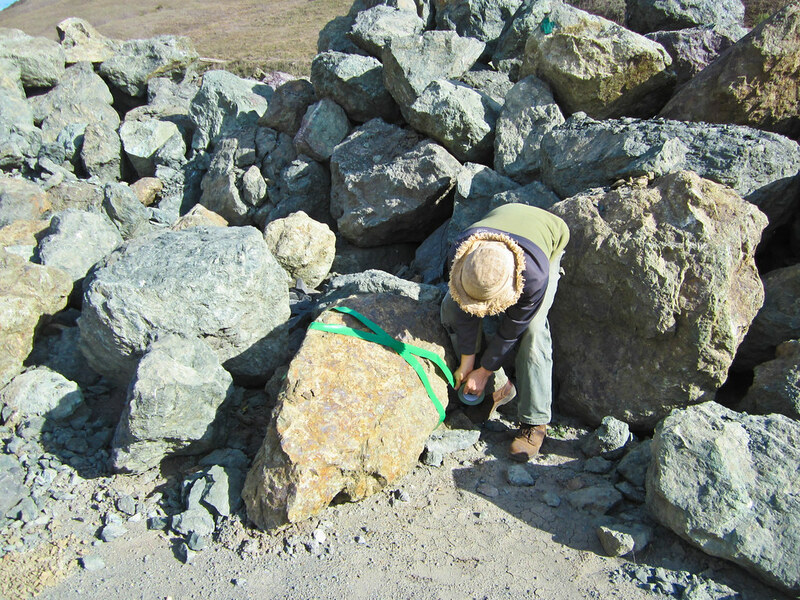 The large berms will be held in place by two and a half tons of rock so Gabe and I went down to the quarry so he could handpick them and have them delivered next week. He marks off the ones he wants with tape. Hopefully I will be able to get up to the garden to watch as they are installed and get some photos of the machinery required to set them in place. I find the whole thing a bit intimidating so it will be fun to see it all unfolding. I’m just the plant guy so some of this stuff is very new to me. Now for a bit of a change of pace we’ll go check in on another one of my garden designs. 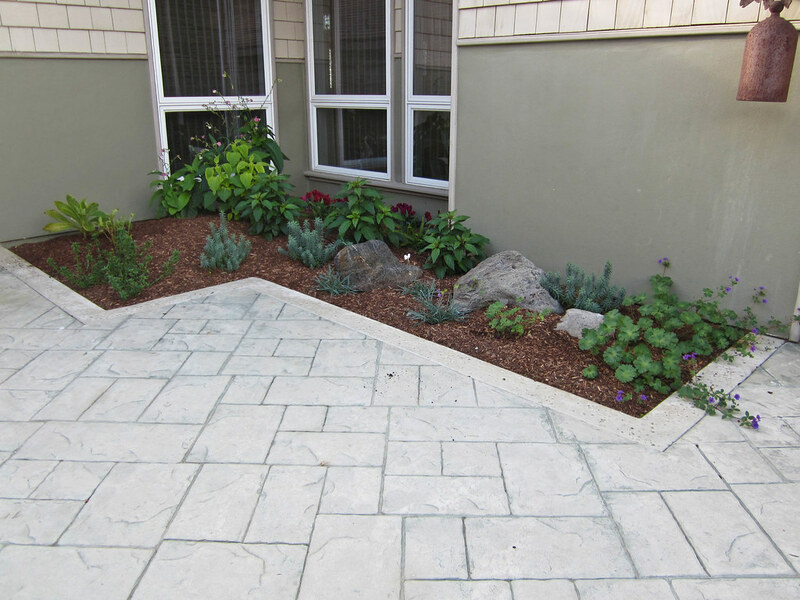 You’ll remember my post on My First Installation back in November and my courtyard garden designed with mostly Annie’s Annuals plants. It was super thrilling but also a bit nerve-wracking as well. Would the clients like it? Would the plants get enough or too much sun? Well altogether the garden is looking great. There was an unfortunate (and rare) heat wave right after they went in so we did lose a few plants and a some of them got a little crispy but now two months later and Annie’s plants are filling in just as beautifully as I knew they would and we are on our way to a very exciting spring. 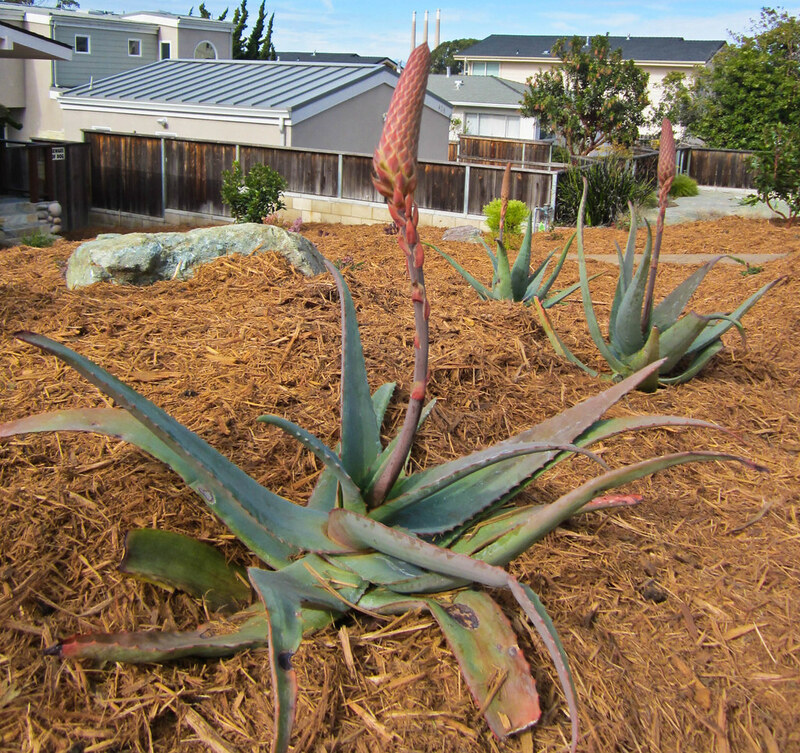 The garden is beautifully mulched and we already have blooms in January. Bed one was originally full of canna lilies and a giant tree fern. Bed two was an overgrown mess full of weeds and Coleonema. While we were here Gabe and I did a bit of weeding and we pinched a few things back. 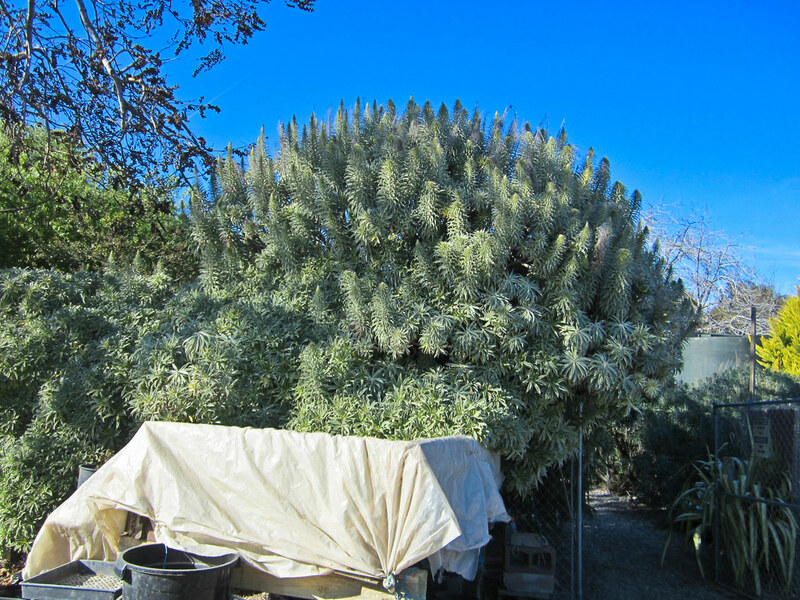 We decided to swap the Musschia and Cantua to give the Musschia more shade and the Cantua more sun. I don’t think it will change the overall design too much even though they are very different plants. Sometimes what works on paper just doesn’t work in real life. 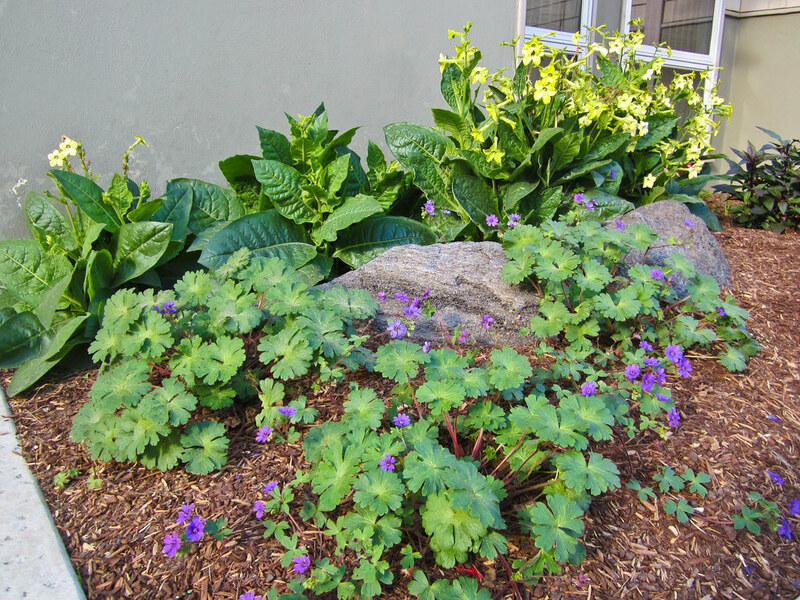 These Geranium ‘Bill Wallis’ and Nicotiana ‘Lime Green’ are already charming now in January. Just imagine them in a few months when they are in full bloom! I was surprised by how big Trachelium caeruleum ‘Hamer Pandora’ had grown in just two months. This is one of the key plants that is included in all of the beds to help tie the design together. *Mental note to buy some of these for my own garden in a few weeks! And just a reminder of the view from the backyard of this beautiful house. Our last stop was a nearby garden that Gabe had recently designed himself. 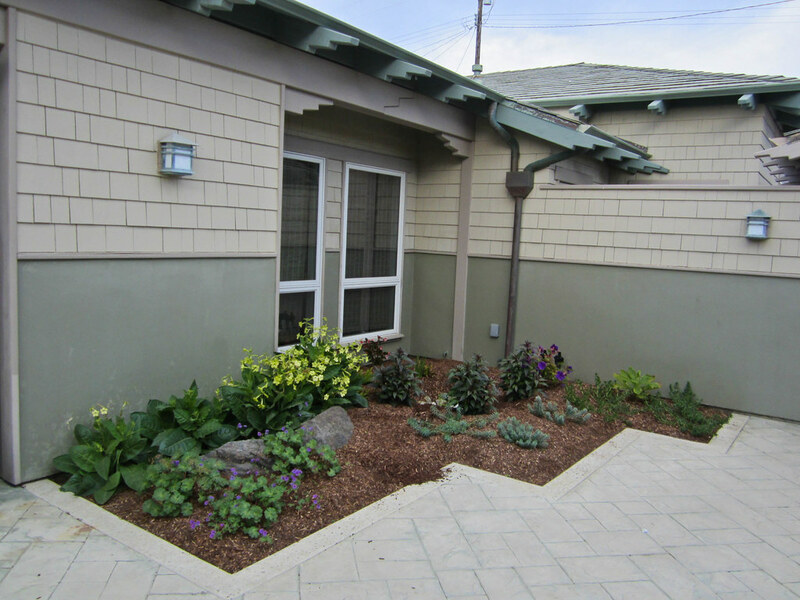 He designed the plantings in front of this guest house around the homeowners hardscaping design. 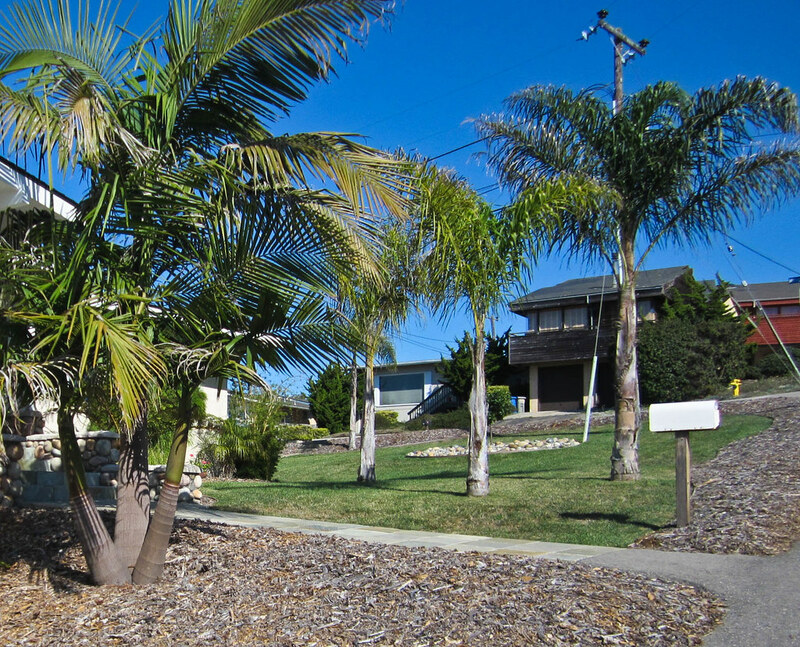 This is another home with beautiful ocean views. This time from the upstairs balcony of the main house. I am a little bit in love with this little vignette of Phylica pubescens with a beautiful piece of driftwood. Hmm…I think I want some driftwood for my garden now! I hope you enjoyed this design update. 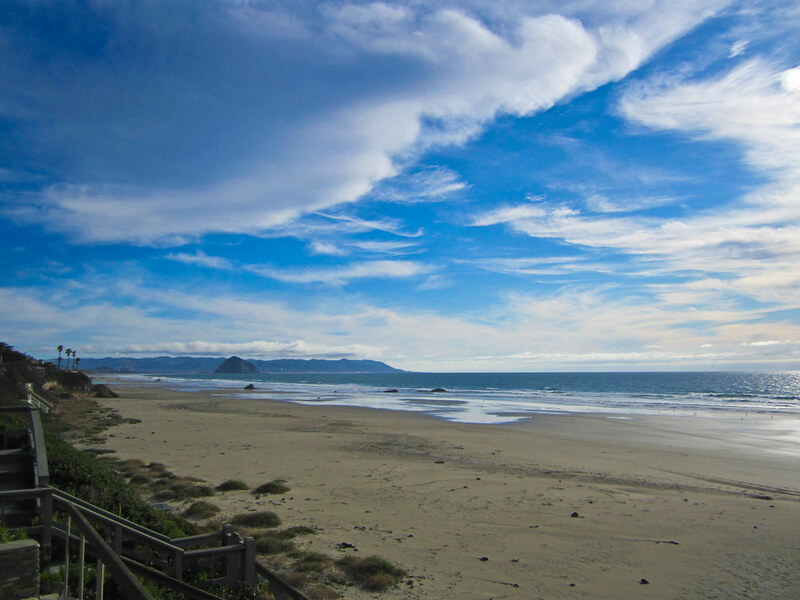 I’ll be posting more updates as the work continues on the Morro Bay property so be sure to check back next week.